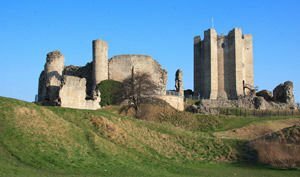 Castle Conisbrough is a hilly area near the town of the same name, Conisbrough in Doncaster in South Yorkshire, England. This castle is one of the oldest tourist attractions in the area and today is visited by over 30, 000 tourists annually. After a major overhaul the fortress became under the tutelage of the department for the protection of English Heritage, although the land is owned by the municipality of Doncaster. The first fortified building of this place was built around 1066 by William de Warenne. It is estimated that roughly in its present shape in place of this was an older building of a Norman castle. Two or three centuries during which possession passes in the hands of the then rulers of England, it got passed to the Warenne family. Ultimately at the end of the 14th century it returned to the "crown" in the face of the son of Edward III. His wife Philippa, administered possession in the name of its successor. Following the signed agreement in 1495 an area of the Castle Conisbrough and the Castle itself is defined as a durable royal domain. According to a study conducted in 1537-1538 by the commissioners of Henry VIII, the castle doors, wood and stone masonry, as well as the bridge and about 55 meters of walling between the tower and gate were collapsed with the ground. From this stage onwards the Castle Conisbrough was not maintained or restored, so you can believe that today the Castle Conisbrough appears as in the mid 16th century. In 1992, however, partial restoration of repairs to the wooden roof and internal floors took place. Castle Conisbrough was rediscovered with public visits in 1995. Today, inside it houses a tourist center with an audio visual program. A curious fact is that the interior and the area of Conisbrough was used for the background of a novel by Sir Walter Scott.